Bottled water consumed by people worldwide has increased so much in the last several years that it generates billions of dollars of sales a year in the United States and other countries. But drinking water from plastic bottles is a really bad idea. First of all, plastic water bottles are a huge environmental problem accounting for large amounts of plastic in the landfills and in water-ways. There is also the issue that some companies remove large amounts of mineral water from natural springs and ground water aquifers. Streams and other sources are becoming threatened by this heavy removal of water for bottling purposes. Third, plastic accumulates in the body similarly to the way heavy metals are filtered and stored. Chemicals in plastic are widely known to mimic the human hormone estrogen. At this point, very little research has investigated the effects of bisphenol A on humans. Based on the limited number of studies that have examined everyday contact bisphenol A, this chemical may increase the risk of miscarriages and polycystic ovarian syndrome, a condition that can cause infertility, ovarian cysts, and baldness in women. In animals however, bisphenol A has been widely researched. In the more than 150 studies on the effects of very low doses of bisphenol A in animals, the chemical has been linked to obesity, prostate and mammary gland cancers, early onset of puberty, reproductive-organ defects, reduced sperm counts, altered mammary glands, and difficulty getting pregnant. Scientists also found that low doses of bisphenol A received prenatally had lasting effects throughout an animal's lifespan. Special interests groups have conducted high dose studies that have allowed them to make claims contrary to low dose studies. · Find a reusable and washable bottle - preferable glass to take your water in. · Try a thermos, which can keep drinks cold as well as hot. · A much better plan is consider installing a filter on your tap water source. There are above and below counter designs that are quite cost effective. 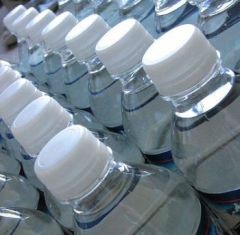 They can improve some of the worst problem water and deliver much cleaner water than bottled water. (Enter the Dirt Doctor in the promo code at checkout and receive 20% off factory direct prices). Bottled water pure drink or pure hype?